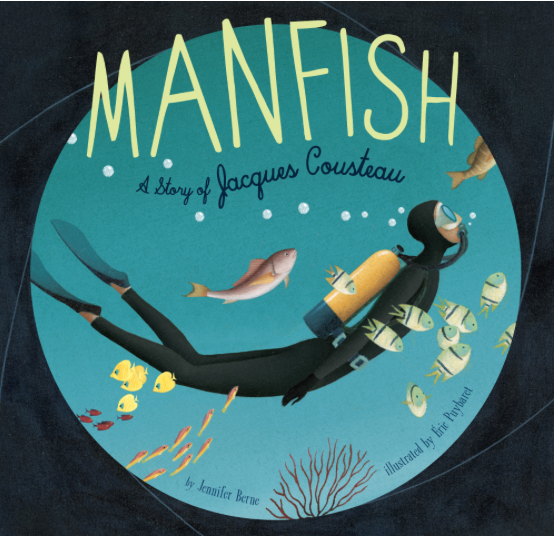 Manfish is a picture book biography of the famed underwater explorer Jacques Cousteau. Beginning with the poem above and then proceeding in narrative form, the book tells the story of Jacques' childhood fascination with the water, his dreams of flying like a fish beneath the waves, and his invention of the aqualung. I was impressed to see that the author, Jennifer Berne, makes a point of underscoring Cousteau's significant role as a conservationist to her child audience, something she could have easily neglected in a children's book in favor of emphasizing the beauty of what he discovered in oceans throughout the world. The moral becomes not just one of exploration and research, but one of responsibility for our planet. Without question, my favorite parts of the book are Éric Puybaret's beautiful acrylic illustrations: some are so beautiful, I can easily envision parents framing them on the walls of their child's bedroom. Along with the descriptions, the pictures invite readers into the underwater world that Cousteau so greatly championed. The book is best suited to older picture book readers, likely those six or seven on up, and would be greatly enjoyed by any child who has a love for swimming, the ocean, and the plants, animals, and amazing sights found underneath the surface.